Another music event to watch this 2013, American hard rock band Aerosmith will be playing live at Mall Of Asia Arena here in Philippines. 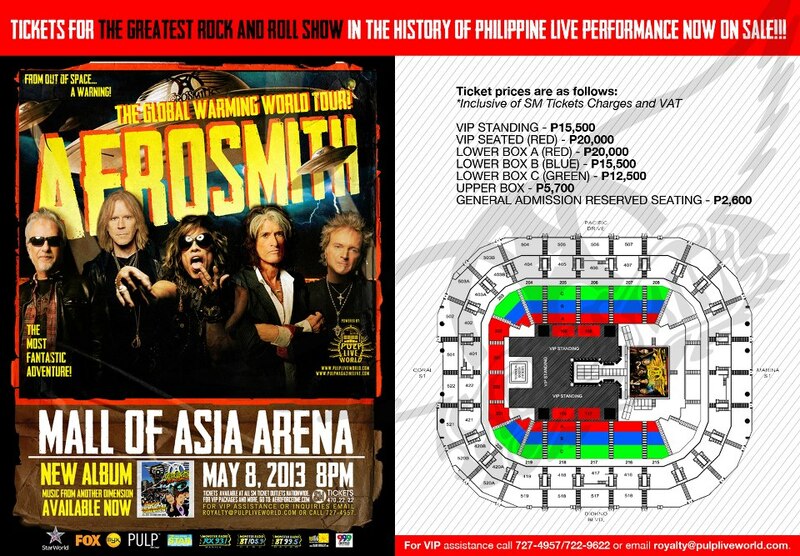 The rock band icon of 70’s to 90’s will rock and roll Philippines on their ‘The Global Warming World Tour’ this coming May 08, 2013. 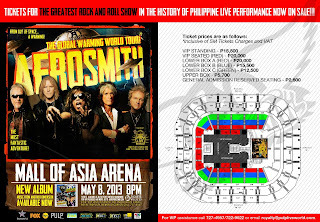 For more details of Aerosmith live in Philippines ticket prices, VIP tickets, reservations and inquiries just continue reading below. Tickets available at all SM ticket outlet nationwide. Why are the Manila ticket prices such a ripoff, compared to Jakarta and Australia?! Considering that the concert is on a weekday and the prices too stiff, good luck to MOA. Hope you fill the venue. Hah! with those prices, i don't think Filipinos will choose to spend on such concert, we are now more keen on travelling. i hope the organizers can still do something to lower the prices. the organizers are out of their minds coming up with such prices!!!!!! parang hindi naman sulit pag ganito prices? ikain ko na lang to sulit pa.
Those prices are too prohibitive!! we're also interested to watch Aerosmith but not with prices such as those...OA!